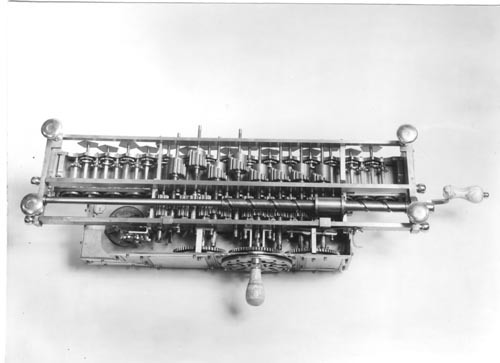 Black and white image of a Leibniz calculator. It has cover removed to show gears and rotating knobs. Verso: Small gold sticker: " Copyright by DEUTCHES MUSEUM Postfach 8000 Munchen 26 BLD NR"
1671- - 1694 21 cm breit, 12,5 cm hoch, 68.5 cm lang Nachbildung"